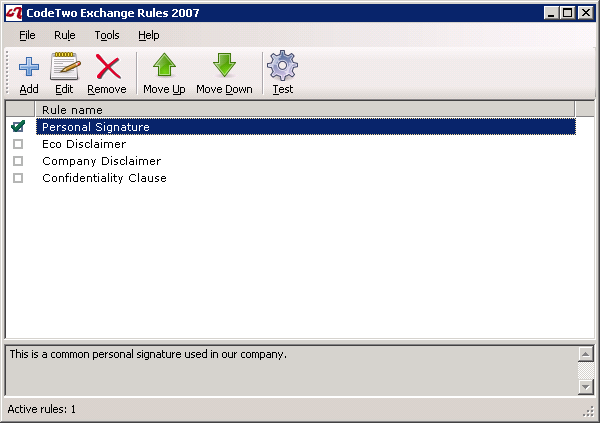 CodeTwo Exchange Rules 2007 automatically adds signatures and disclaimers to outgoing and internal email sent via Exchange Server 2007. Features: creating a global disclaimer for the entire company, separate footers for different users containing sender's data from AD, built-in signature editor to compose HTML disclaimers incl. graphics, viewable footers in Sent Items, AD integration, diagnostic tools: archiving tool, quick rule copying. ...... without user interference. The program adds important information, e.g. company details and logo, confidentiality clause, sender's personal data to corporate e-mails in a simple way. Qweas is providing links to CodeTwo Exchange Rules 2007 2.2.5 as a courtesy, and makes no representations regarding CodeTwo Exchange Rules 2007 or any other applications or any information related thereto. Any questions, complaints or claims regarding this application CodeTwo Exchange Rules 2007 2.2.5 must be directed to the appropriate software vendor. You may click the publisher link of CodeTwo Exchange Rules 2007 on the top of this page to get more details about the vendor.